Several Ugandans now live in China. Every year even larger numbers come to trade, visit, and study in different parts of China. 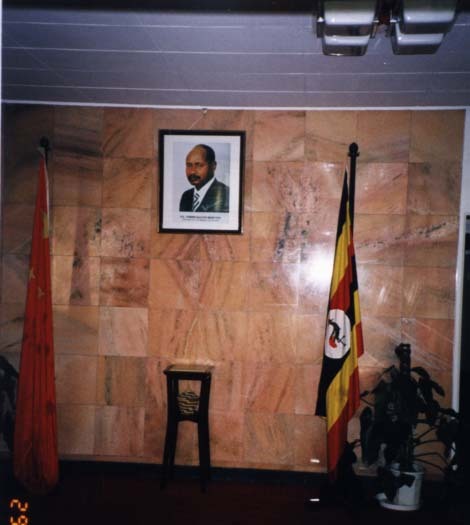 Information on this part of the Embassy web site is for the benefit of Ugandans living in China. Consular staff will do everything they properly can to help Uganda citizens in difficulty in China. This website explains some of the things that we can do to help - and some of the things we can't do. Welcome to your embassy, your home away from home. We are here to serve you by providing you with accurate information from home, and to help you with the formalities of renewing or replacing your Ugandan travel documents. Please, give us a call, or drop us a line once in a while. There are two categories of first-time applicants, and the requirements will vary slightly with each category. One category is that of individuals who are responsible adults and have never applied for or been issued a Uganda Passport. The second category is that of individuals who, by virtue of being minors, have been previously listed on their legal guardians' passports. Upon attaining the age of 16 (Sixteen), these young adults qualify as first-time applicants for their own passports. First-time applicants for a Uganda Passport must establish, beyond any doubt, that they are Citizens of Uganda. They must provide documentary proof of their claim to the status of Uganda Citizen. This citizenship status must have been acquired in one of three ways: by birth, by descent, by naturalization, and by registration. All applications for new passports are processed by the Passport Office, in Kampala. Applicants are advised to provide all the necessary information on all the forms that have to be filled; without forgetting the documentation that the procedure demands. Failure to comply with all the requirements of the process will result in unnecessary delay and possible denial of the passport. All the forms needed to expedite the process are available at the Embassy. 1. Fill in Form "A", APPLICATION FOR A UGANDA TRAVEL DOCUMENT. particular attention to the NOTES section on side two of the form. 2. Fill in Form "B", CITIZENSHIP VERIFICATION. your Birth Certificate or other, acceptable form of proof of birth, e.g. Baptism Certificate. provide the appropriate certificate of naturalization or registration. These requirements and procedures are to be followed only by individuals who have previously been listed on their legal guardians' passports. If you are a young adult and reached the age of Sixteen (16), but have never been listed on a legal guardian's passport, follow the procedures and requirements for first-time adult applicants above. 2. Fill in the short form PARENTS' BIOGRAPHICAL INFORMATION. 3. Provide your parent's passport (in which you are listed). Your Uganda Passport is the property of the Uganda government. It must be kept in a safe, secure place. It is advisable that you note the passport number and its date of issue on a separate piece of paper and keep this information in a different place. In the unfortunate event of its getting lost, it is your obligation to report the loss to the local authorities, without delay. Remember, should any unauthorized person use your passport fraudulently, or for perpetrating a felony, you are liable. Report the loss of it to your local police and obtain a police report. In an effort to expedite your business transaction with the Embassy, and save you valuable time, please contact us immediately. The originals of the above documents should be forwarded to the Embassy of Uganda for Certification. There is no Fee charged for this service. You will need to include a self-addressed, certified, stamped envelope for, for quick return of your documents.